I added the contest to the calendar when I noticed it was approaching, last week, I set about prepping. I had played with the N1MM contest logging software, previously, and took this as an opportunity to fully explore the software and prep for Field Day. I agreed to set up the computer logging and digital stations for our club’s Field Day operations and N1MM was a likely candidate, given its ubiquity. Quick conclusion? It’s perfect for contest logging, but I won’t be supplanting HRD Logbook for day-to-day logging. 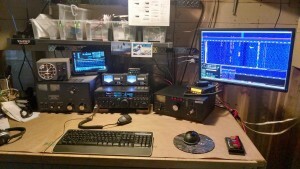 Saturday evening (around 01:00z – 18 hours before the contest was to begin), I stepped into the shack, pointed the hexbeam east, warmed up the tubes, and started calling CQ on 20m. My intent was to practice with the logging software and work out any last minute kinks in the system. between 2345z and 0200z, I have fantastic luck with propogation between my station and almost the entire continental US, as well as Alaska. A few QSOs into the run, a local ham, WB7ELX, gave me a call and after a couple pleasantries, he moved along. N1MM showed big red text in the “Info” window: “K7ADD spotted on 14.246 by WB7ELX” Very quickly, I was working a pile-up. This has unintentionally happened during the greyline “witching hours” and I’ve enjoyed the adrenaline rush of working a pileup. Saturday evening, I worked 45 stations in less than an hour from all over the US. These weren’t terribly hurried contacts, but I set the tone that I was turning over QSOs quickly. I wished people a “Happy Easter,” mentioned that I was working the contest on Sunday and asked them to come give all of us a shout. Conditions weren’t great, but I was confident about Sunday, given this experience. I slept horribly Saturday evening, still fighting some jetlag from my trips to VU3 (Andra Pradesh, India) and BY1 (Beijing, China). I awoke Sunday with a slight headache and some flu symptoms, but excited for the contest! A couple cups of coffee and I grabbed water, Altoids, and headed for the shack. I got on the air a few minutes before the contest started, at 10:50AM Pacific. I poked around to see what bands were hoppin’, hoping to grab some 10m and 15m action. No such luck, 10m was dead, with the exception of KC4TVZ. I can often hear him here in WA with a CQ on repeat… my 10m beacon of choice. “Oh well, I’ll give it a try, anyway.” 3 QSOs in 10 minutes, and I moved on. 15m was not much better, so I went about staking out a spot in the already crowded 20m band. I managed to find a spot up at 14.325 — further up the band than I’d hoped, verified it was not in use and started calling right at 1800z. Conditions were still far from ideal, with a relatively high noise level. I was hopeful, given the SFI of 169, though. I made 14 Qs by 1842z and AE7NR, Rob, dropped by. He spotted me and the fun began. My QSO rate doubled and I’d worked 26 stations in the first hour. I’ll post about N1MM and logging software another time, but it does a fantastic job of keeping the op aware of QSOs rates and available multipliers (I was running “assisted” mode, logged into a cluster). I was hit with some pretty nasty QRM on 14.325 a couple times and moved down to 14.268 and then 14.282, often playing cat-and-mouse with changing propagation and QRM. I poked my head into 10m and 15m a couple times, throughout the day. Made a couple contacts there, but couldn’t match the 20m QSO rates, so I settled on grinding it out on 20m. It was nice to have a directional antenna (K4KIO Hexbeam) and a good wire antenna (ZS6BKW) for listening. Mid-morning, I worked my prediction for the #1 spot in the W7 calling area, K7CDX, Michelle. I mentioned that she may know a mutual friend K7CXN, Christian, and asked her to say hi. Small world and all that. I don’t know her working conditions, but her station sounded great. I suspect she benefited a bit from the “YL factor” and very persistent spots. A preliminary congrats to Michelle! She’s a skilled op with roughly similar amount of time in the hobby and deserving of the top spot, if she lands it. I also dropped in on W1AW/0 in North Dakota to pick up a multiplier. I chatted with AG5Z, Larry and his friend N4FF, Ike, in Mississippi for bit. With those two exceptions, I attempted to keep turning over QSOs on 20m. F5JD, José, surprised me at 2323z, giving me a DX multiplier. I said it earlier, but cluster spots make a huge difference. KD0NMZ, Mike in IA, and KD5RXP, Brian in TX, both gave me a bump as greyline approached and conditions improved. I ended the contest with a bang topping 45 Qs in the last hour. KB1VUU, Rob in MA, made it in under the wire and brought the day to a close. Overall, I had a blast and learned a ton. I’m super pleased with my effort, regardless of how I finished… that wasn’t the point anyway!